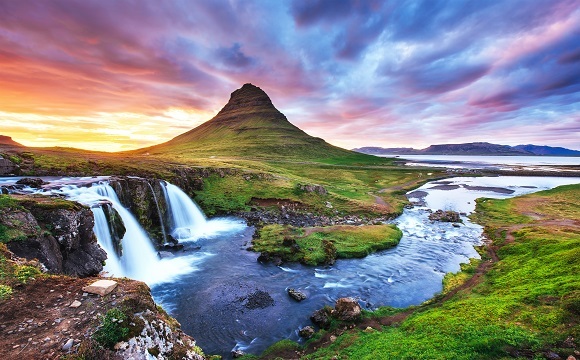 Prepare to explore the Icelandic coastline and venture into the interior of this epic land of fire and ice to discover amazing landscapes and friendly locals. Head to Grímsey Island, an island on the fringe of the Arctic Circle with a tiny community of no more than 100 locals. Cross through the lava landscape of Snæfellsjökull National Park, towards the 700,000-year-old Snæfellsjökull volcano. Board a local boat and explore Skjálfandi Bay, home to more than 15 species of whale. From the revered humpback whale, minke whale and colossal blue whale to white-beaked dolphins and an array of birdlife, revel in the awe-inspiring wildlife. There’s no better way to see Iceland than aboard the elegant Ocean Diamond, renowned for its stability and speed. All pricing and details are correct as of 12pm, Wednesday 8 August 2018. 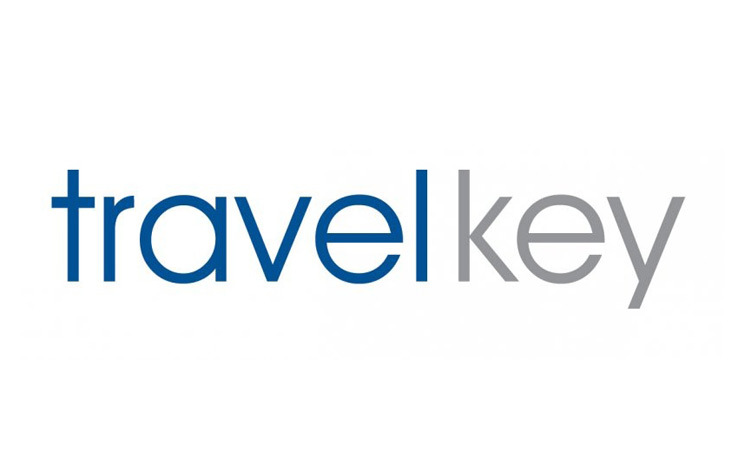 All details and offers are subject to availability, change and fluctuations. Offers may be withdrawn at any given time without prior notice. Be met on arrival and transfer to your ship, the Ocean Diamond, your home for the next nine nights. As your ship sets sail, enjoy dinner. Enjoy an excursion among the islands of Breiðafjörður Bay, keeping an eye out for wildlife. Afterwards, drive through the lava landscape of Snæfellsjökull National Park towards the glacier that gives the park its name. Enjoy an Insider Experience or spend the morning exploring the town. Tonight, cruise past the Látrabjarg cliffs, the westernmost point of Europe and a haven for native birds like the Atlantic puffins. 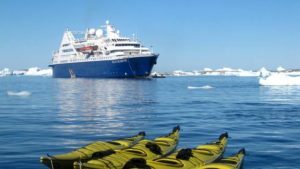 As you dock at the port of Ísafjörður, enjoy an excursion to Vigur, home to five human residents, as well as puffins, eider ducks and Arctic terns. This afternoon relax on the sun deck as you sit back and take in the Hornbjarg Cliffs, rising 534 metres from the sea. This morning you’ll be greeted by the sheer beauty of the Western fjords. Here, enjoy an Insider Experience, choose to enjoy time at leisure and explore the old buildings of Ísafjörður, or visit the maritime museum or cultural centre. Head to Grímsey Island, an island on the fringe of the Arctic Circle with a tiny community of no more than 100 locals, incredible basalt cliffs and a large variety of birdlife. Here you’ll enjoy time at leisure, perhaps choosing to trek across the island at your own pace. Arrive at Siglufjörður, a picturesque town built into a small fjord with the rugged mountains as its backdrop. In the early 1900s, a booming economy due to the herring industry resulted in a prosperous town with some marvellous Icelandic architecture. Take some time to explore the town and visit the Herring Era Museum. Be on the lookout for whales as you cruise to Eyjafjörður following dinner. Disembark your ship on the north coast of Iceland to explore the Akureyri Botanical Garden. Admire species from Africa, China and the Mediterranean growing alongside Alaskan, Greenlandic and indigenous specimens. 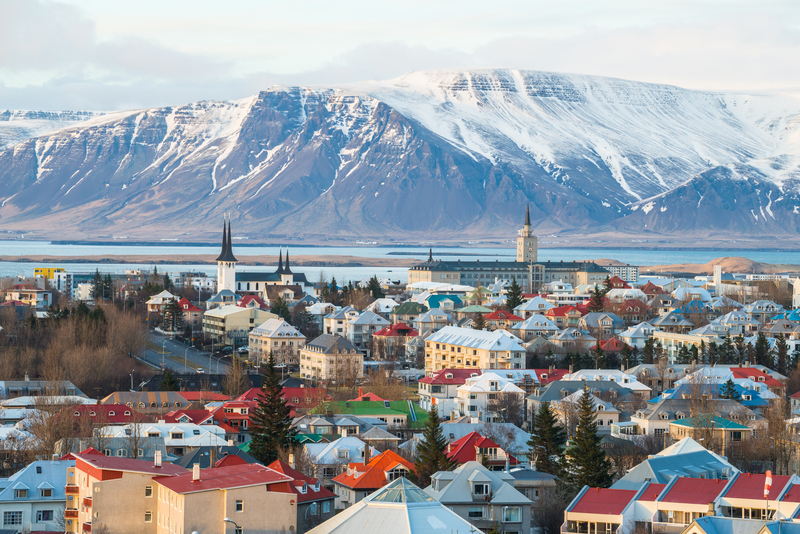 Afterwards an Insider Experience, explore the town of Akureyri and visit Arts’ Alley, the cultural centre of the city, or the local church with its beautiful views over the fjord. Return to the ship for lunch before an afternoon at leisure. Perhaps explore the city further, or enjoy a hike in nearby Kjarnaskógur. An optional tour will take you to a world of lava fields, boiling mud pools and sulphuric steam vents of Lake Mývatn-Krafla. 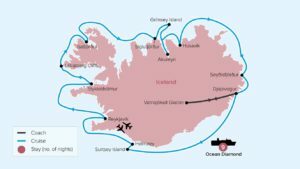 Here you will have time to unwind in the natural hot springs or embark on a bird watching walk before returning to the ship via the almighty Goðafoss waterfall. Board a local boat and explore Skjálfandi Bay, home to more than 15 species of whale. From the revered humpback whale, minke whale and colossal blue whale to white-beaked dolphins and an array of birdlife, revel in the awe-inspiring wildlife. Your morning gets off to a truly delightful start with a whale watching tour. Head back to your ship for lunch before an afternoon at leisure in town. Explore the streets, take in the Whale Museum, wander the Exploration Museum or visit the quaint local church. This morning after breakfast, your ship will arrive at the picturesque 19th-century harbour town of Seyðisfjörður. On disembarking here, a walking tour will take you past the bright colours of the Norwegian-style buildings and shops that are famous for their Icelandic patterned knitwear. 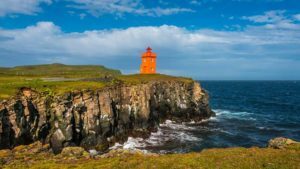 Later, the keen walkers might choose to embark on an energetic optional hike up the Fjarðará river trail through a verdant landscape carpeted with wildflowers, or perhaps embark on a hike to the magnificent Hengifoss waterfall. Disembark and travel by coach inland to the shimmering Vatnajökull Glacier, one of Europe’s largest glaciers. 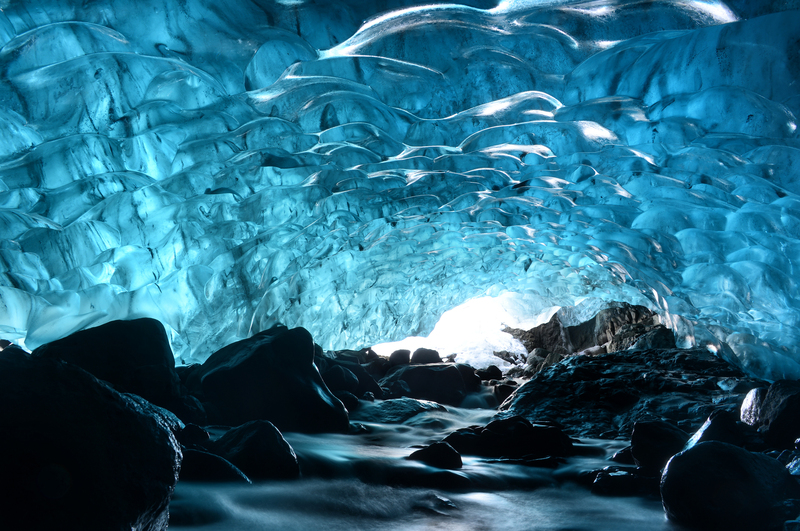 The thick icy walls of the glacier conceal some of Iceland’s most active volcanoes. You may choose from a number of optional excursions to make the most of this experience. Perhaps take an exhilarating 4WD or snowmobile ride to traverse the Vatnajökull Glacier. Alternatively, join an excursion and watch as the glacier calves into the Jökulsárlón lagoon. Keen hikers may like to venture to the Waterfall Valley and see the river Fossá weave through the lowland towards the sea. 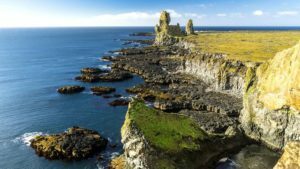 Your final day in Iceland is spent exploring the Westman Islands (Vestmannaeyjar), an archipelago that possesses a dramatic volcanic history. This morning, circumnavigate Surtsey Island, born from a volcanic eruption in 1963. This afternoon, visit the island’s only community, Heimaey, where half-buried houses are spotted peeking out from under the volcanic debris. Later, if time permits, board a Zodiac to explore the surrounding cliffs and coves. Tonight, enjoy your final dinner on board. Your journey ends in Reykjavík. After breakfast, disembark your ship and transfer to the airport.